During the winter crab season we took full advantage, making sup mang cua (asparagus and crab soup) using fresh dungeness crabs. But we also had some king crab meat given to us by The Food Addicts and so we made some bun rieu (crab noodle soup). This soup is very hearty and great during the winter months as it combines some of our favorite ingredients of tomatoes, tofu, and crab. Traditionally this soup is made with whole blue crabs which are then pounded in a large mortar/pestle. The crab meat is separated from the crushed body. The body of the crushed crab is then put into a fine mesh cloth or sieve and water is then strained through, forming the base of the broth. Do I make my bun rieu this way? Heck no!! It’s too time consuming! But when Hong was growing up, he would help his mom make bun rieu this way. The result of is a much more intense crab flavored broth. Almost everyone I know uses a can of minced crab in spices as a substitute for this labor intensive process. So if Hong wants his bun rieu to taste like his mom, he better do the extra work. For me, a good and easy alternative is to use the minced crab in a can and add that to my all purpose pork broth that I use to make many of my soups. But if I’m really pressed for time, canned chicken broth will also do. Unlike pho or bun bo hue where there are slices of meat added, the key protein component to this soup is the crab meat mixture, rieu, made of the minced crab (or alternatively dried shrimp), ground, pork and egg. It’s essentially a Vietnamese version of crab cakes but in a soup! Some cooks like crab mixture more formed, almost like a meatball or patty. While we like it more airy and loose, like pillowy mounds of deliciousness. You can adjust how you like it by the ratio of egg to meat in the recipe below—the more airy and soft, the more egg and less ground pork. Another key ingredient in this mixture is shrimp paste for that extra umami. Other variations of this soup includes oc/periwinkle called bun oc. Here’s a quick video on how to make this simple yet delicious soup! To make the split rau muong, there’s a very very high tech process…in the form of a $2 utensil you see above. It’s composed of a thin rod and at the end, a sharp turbine like cutting edge. Pluck the leaves of the rau muong and insert the long metal rod into the stem opening. With one hand hold the device at the top and with the other, grab the stem and with a quick fluid motion, push the stem through the blade opening. These special devices are often sold at the Asian markets and are so handy in making perfectly split rau moung stems which gives bun rieu a refreshing crunch. With crab season and the cold weather we’ve been having lately, bun rieu is a great soup to enjoy. But honestly, it’s so delicious and not labor intensive that we enjoy eating this soup year round and think you will too. The crab paste mix is soft and pillowy but stays together. If you like it more loose, add an additional egg or decrease the ground pork in half. Annatto seed oil (without the scallions) can be made in larger quantities and stored in fridge for months. If using prepared annatto seed oil, simply heat and stir in scallions. Soak dried shrimps until softened with hot water for about 30 min to 1 hr, then mince finely until fluffy using food processor or minifood chopper and set aside. This can be done day in advance and refrigerated. 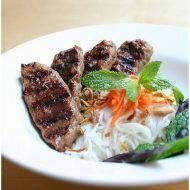 Cook the vermicelli noodles and set aside. In small sauce pan, heat canola or vegetable oil with the annato seeds over medium heat. When the seeds release their red color, remove the seeds with strainer. (You can prepare this oil in larger quantities in advance and keeps months refrigerated). Add the scallions and turn off heat and set aside. At the same time add pork or chicken stock into large pot and bring to boil. In the meantime, make the crab mixture. Combine ground pork, can of prawn/crabmeat in spices, shallots, fine shrimp paste, dried shrimps, pepper, and egg into a food processor. Pulse for about 30 seconds until it becomes a fine paste. Add the crabmeat to combine. When the stock comes to a boil, turn down to simmer and slowly add this crab mixture into stock by the ladle full. The crab mixture will sink but as it cooks will float. Now add the tomatoes and tofu and cook until tomatoes are tender. Finally, season stock with additional fish sauce (or shrimp paste) as needed. 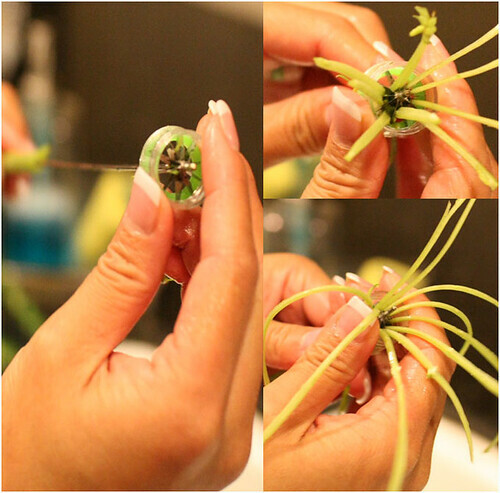 Garnish with annato scallion oil. 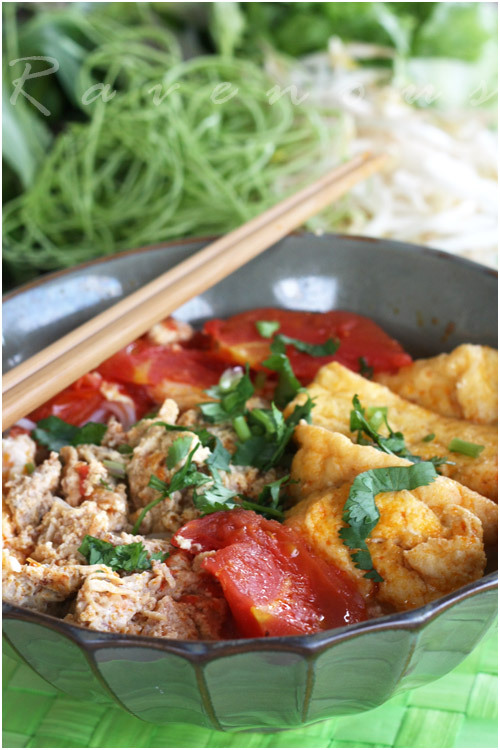 Add vermicelli noodles to bowl and ladle on the bun rieu. Serve with vegetable and herbs and enjoy! wow! I just had a bowl last week and wondered exactly what all the stuff was in the soup. It all seemed so very mysterious. Your photos look wonderful. looks delish! my hubby makes a killer pot of bun rieu too! wow that's such a cool tool! The crab meat mixture sounds amazing! My FAVORITE! Thanks for the recipe! that is the most gorgeous bowl of bun rieu that i have ever laid eyes on. unbelievable!! wow, didn't even know there was a utensil to split the rau muong! i've always seen my mom and aunt just cut them by hand which takes forever. i need to make this with the king crab we still have at home. so little time.. so much to do. btw, nice nails kim! 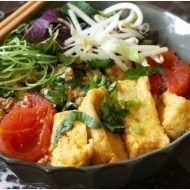 Foodhoe: Yes, the bun rieu crab mixture does seem very nebulous, but it's pretty simple list of ingredients that really easy to make. anhesty: ooh…we'll have to check out your version! pigpigcorner: That tool is easily overlooked and not many people know about it! citynitz: Thanks!! Happy New Years! KSM: Awww shucks, you're totally overblowing it.. but thanks!! Krissy: The rau muong splitting tool is quite the time savor and makes perfect cuts! Your bun rieu looks rac ngon. Wish you guys lived closer. Would love to have constant access to your leftovers! Crab noodle soup sounds excellent! I would love to make it during our blue crab season here. Thanks so much for sharing this recipe, bookmarked! i see that kim completed her assignment…lol. again, a great dish. i'm now on a roll of eating 2 out of 2 of ur most recent posts…haha. 5 star foodie: even though it's traditionally made with fresh crab meat, nowadays hardly anyone we know make it that way..
Tung: You're our official guinea pig! Ooh, this sounds like it is packed with flavor. I have never cooked with the minced crab in spices. Will be fun to hunt it down in our local Asian market. Don't know if they will have that handy little tool for the rau muong though…that's pretty cool. I love the $2 utensil u used, so handy! This is a comforting and beautiful bowl of soup noodles. TableTalk: Happy New years to you and yours! Tricerapops: That's hilarious..we'll have to copy that! David: You're absolutely right–happy new years! I love that $2 implement of splitting. I'm sure it's still a tedious chore. You guys are dedicated. I like that. Somebody has to be. It's certainly not me! This is my favorite-est Viet noodles. Oh my, looks amazing. I need a few of the ingredients so I see a quick dash to the grocery store in my future. 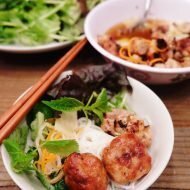 Seriously this is the one stop shop for vietnamese recipes! I was craving for this but didn't have the time to make it, then I saw your photos and it made me crave for it even more. Your bun rieu looks sooo good! Wow! It must be very flavourful and delicious. I can imagine slurping up the soup!! I agree 100% to what Cathy, Ms. Gastronomer stated, I wish you guys lived closer! Bun Rieu is some damn good stuff! I called and they do serve it on the weekend! Hope to try it soon!! This looks great! I've really enjoyed browsing your blog. love the gadget that make the split rau muong! What a great bowl of noodle soup. Wow! 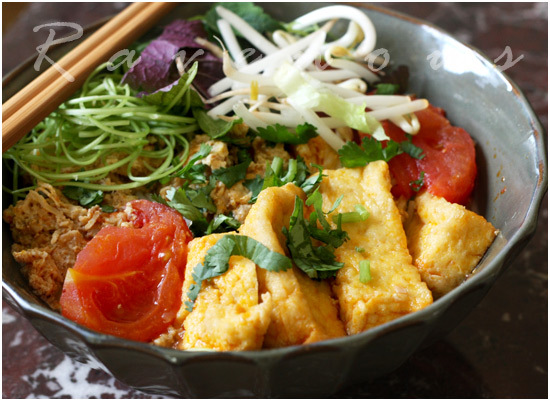 I have a major craving for bun rieu now! I would like to have a chance to try such a crab noodles soup. lovely bowl of noodle! I never made this because I'm too lazy to pick the crab meat, I must try the can too! Stunning photos! And I NEED this device! Off to Chinatown I go! Thanks so much for the recipe, I made a big pot last weekend and have been happily eating it since Keep up the good work!!!! This is beaaaautiful!!! I love all the colors that are going on in the bowl I love the fried tofu mmmmm I can only imagine the smells that this dish would have, if only I had it in my belly…like right now. I must get that device to cut rau muong. I did not know that existed. I use to painstaking split them with a knife. A very useful tip. Bun rieu is so simple to make, you all should try it! I think for Tet, we'll have a giveaway for that rau muong splitter! Thank you for commenting on my blog! I'm so glad you did because it let me find yours. 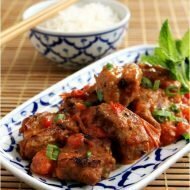 My mother is Vietnamese and I grew up loving Vietnamese food but it is impossible to get recipes out of her because she doesn't measure anything. It's always "A little bit of this, a little bit of that". 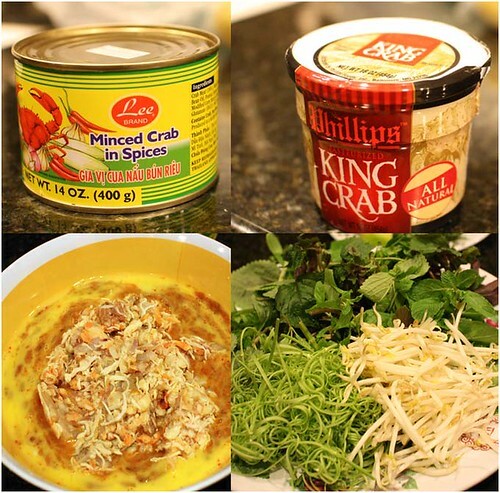 We grew up in Alaska and my mom would always make bun rieu with fresh Alaskan king crab. I'm thrilled that you posted this recipe online! Thanks! Thanks for the amazing post! Your recipes and instructions are so easy to follow. The pictures are the BEST!!! I am hungry now! thanks for posting – I know I'm necroing but kudos once again. I know that depending on where you live, the asian stores do not carry certain vegetables or maybe even that utensil, which I will surely keep an eye out for, but it'd be great to experiment with other veggies and see what the taste is like. I've order this every time we go to my boyfriend's aunt's restaurant, but only recently did I learn the name of it. I've followed you both for a while now and finally I have a recipe to try and make it on my own! Thank you so much! I know all recipes will surely differ from others and maybe with a little experimenting, I might have my own one day, but given yours will always be the "original" I got it from. What an exciting recipe. my coworker reproduced it at home and was eating the leftover at the kitchen at work. He just sent me this link. I have most of the ingredients at home. will try it soon. thanks for sahring! Wow! This requires a lot of work to be done! I like it. It looks delicious and tasty! I'm trying to learn cooking since I'm living independently. Thank God I found your blog. I'll try to cook this one tomorrow, and I hope angels will help me to make my meal taste delicious. LOL! Honestly, I want to own a restaurant which caters Asian foods. Maybe if I'm ready to manage a business, I'll get my capital from merchant loans. yes, this the fine shrimp paste is mam ruoc. If we’re in a hurry and can’t make our own pork broth, then we go with chicken broth. Otherwise they’re both pretty good! We made this today at a friends house!! Sooo delicious and not that hard! Just had leftovers reheated and still so good. THankyou for all the tips! So handy for us generation who always watched out parents cook but could never replicate what they did, now we can with recipes like this! we’re so glad it worked out for you and yes, now you can make everything your parents made for you and then some! Again, how long is the pate good for? Thane again. probably up to a week, but freezable. Do you know approximately how many servings this recipe feeds? I am planning on making this tomorrow night for 5 people. Thanks! Love your blog! should feed 5 ok, but recipe is easily adjustable. good luck! Wow!! Love your pics! They say that we eat with our eyes, and my eyes are very pleased! I’d made this dish before, but clearly had some ingredients missing. Will definitely try your recipe out. Thank you for your thorough and clear easy to follow recipe and instructions! Thank you for sharing! Thank you SO MUCH for this awesome recipe!! I’ve made this twice already and I love how much time it saves me. I used to make this the old fashion way with fresh crab and stock, but it took way too long. It’s my boyfriend’s favorite noodle soup so i love being able to make it knowing it won’t take me hours in the kitchen. Thanks again!! You guys are awesome! AMAZING. I’d never seen this dish before when I was travelling in Vietnam, is this something homemade? I’d love to taste this dish since the flavours are all just melting together in my head! Are you in the process of publishing your recipes and photos in a cookbook? This one is a fave of mine but we’ve tried a couple others and all very yummy…It would be great to have your recipes beautifully compiled in book, existing amongst any foodie’s collection. thank you for the feed back…as of now. no plans so visit us on the web often! Can you tell me what is ground pork? Just normal pork or?? I try it. Love it. My sister ask for the recipe So I told her about your websites. Will try other recipes of yours as well. not for certain about this one and never explored the origins. all of our friends and family from both regions make this dish, but would if have to guess, it would be a southern dish as its similar to canh chua in some ways and crab more abundant in the south…thanks for stopping by! I never liked pho. But bun rieu–man, I can have that all the time. Plus a few pieces of pork blood. My mom taught me a very simple recipe and being Chinese, all broths were homemade I cannot wait to try this. Thank you for sharing this. We love our crab in San Francisco! How do you make the ckn stock? This is exactly what I want to eat tonight with a snow storm brewing outside. How many does this serve? I just want to make enough for 2…so a total of 4 bowls worth. I printed out the recipe for my mom. The print function on the web page printed the recipe and ALL of the comments. Wasted close to 20 sheets of paper. Very disappointed. sorry, and thanks for letting us know! didn’t know about that, must be a bug. Where did u get that $2 tool? I want one!! Also, one of the most traditional recipes, since this is very similar to the recipe to how my parents cook bun Rieu at home. So I needed guidance through the steps.